April 29, 1863 - The Dalhousie College Act comes into law. The Act included a condition that a medical faculty was to be established within the College. 1868 - Faculty of Medicine is established. Only primary courses were offered and students transferred to other universities to complete their training. Fourteen students were enrolled. 1870 - Faculty of Medicine begins offering full program. 1872 - Dalhousie College grants first medical degrees. 1873 - Faculty of Medicine closes. 1875 - Halifax Medical College is established. Dr. A. P. Reid is Dean. 1889 - Faculty of Medicine is re-established. The Medical College remained as the teaching body and the Faculty of Medicine took the role of an examining body. 1910 - Carnegie Foundation releases the "Flexner Report (conducted by Abraham Flexner of New York and Dr. N.P. Colwell of Chicago). The report was based on a 24 hour visit to Halifax in 1910 and noted "inadequate facilities for training." 1911 - Halifax Medical College is fully reintegrated into the University. Dr. A.W.H. Lindsay served as faculty secretary until 1915. December 31, 1915 - Dalhousie Stationary Hospital No. 7 sails on the Metagama from Saint John, New Brunswick to Plymouth and begins operating at the Shorncliffe Hospital in Kent, where they provided medical attention mainly to Canadian soldiers. The team was subsequently called upon to serve in France in 1916 and took over a former British stationary hospital in Le Havre. In 1917, Stationary Hospital No. 7 was moved to an old chateau near Armentires and began treating German prisoners of war as well as Canadian soldiers. 1917-1919 - In December 1917, the greatest manmade explosion prior to Hiroshima occurred in Halifax Harbour. The explosion leveled the North End of the city and left thousands dead and thousands more homeless. During that time, Halifax received assistance from around the world, including significant funds courtesy of the residents of Massachusetts. The Massachusetts-Halifax Health Commission was established to organize relief efforts. 1919 - Colonel Dr. John Stewart was among those who returned. Dr. Stewart became the Dean of Medicine for the faculty in 1919 and remained in that position until 1932. 1924 - Grants from the Carnegie and Rockefeller Foundations led to the establishment of a visiting outpatient dispensary in the new Public Health Clinic. The clinic was staffed by doctors from the Faculty of Medicine. 1925 - The Medical School obtained an A1 accreditation from the American Medical Association. 2010 - The Faculty of Medicine opened a teaching campus in Saint John, New Brunswick. Fonds consists of records that document the administrative and operational activities of the Faculty of Medicine. These include general correspondence, minutes (faculty and departmental), financial records, reports, statistics, administrative relationships, program information, course materials, examination records, newspaper clippings, memorabilia, photographs as well as provide evidence of relationships with outside organizations. Fonds consists of records that document the administrative and operational activities of the Faculty of Health Professions (UA-16). In these pages, you will find a number of interesting accounts of how the profession of occupational therapy has evolved in Atlantic Canada. Canadian Association of Medical Students and Interns. (1947, April). Dalhousie Medical School. CAMSI Journal, VI(2). 22-23. Dalhousie University (1961, October). Brief and evidence to the Canada. Royal Commission on Health Services. Hearings. (v.3, 490-691). Halifax, Nova Scotia. Hattie, Dr. W.H. (1925, May). Historical Sketch of the Dalhousie Medical School. The Canadian Medical Association Journal. 1-6. Macdonald, Charles (1870). Inaugural Address Delivered in Convocation at the Opening of the Eighth Session of Dalhousie College and University, Halifax, 1st November, 1870. [Microfiche]. Printed for the University by the "Nova Scotia Print. Co."
MacLeod, Enid J. (1990). 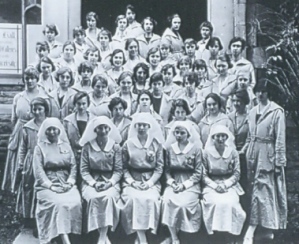 Petticoat Doctors: The First 40 Years of Women in Medicine at Dalhousie University. Lawrencetown Beach, N.S: Pottersfield Press. Massachusetts-Halifax Health Commission. (1932). 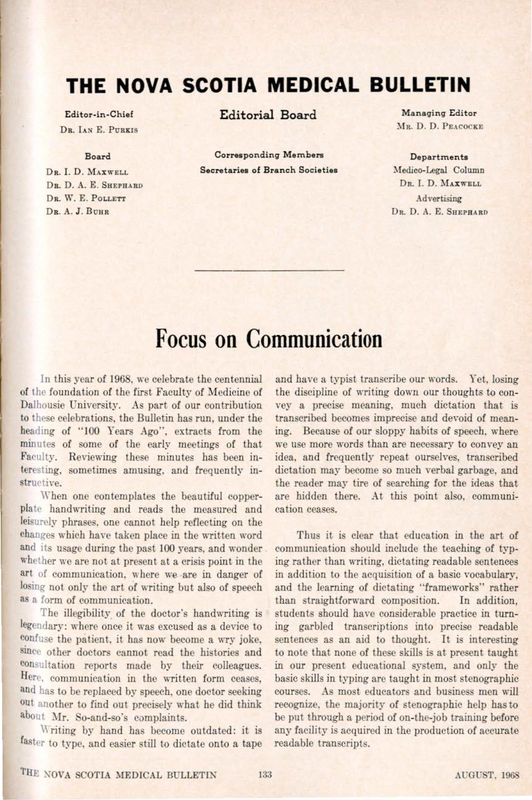 Final Report of the Massachusetts-Halifax Health Commission - October 1919 to October 1929. Halifax, N.S. Murray, T.J. Nobel goals, dedicated doctors: the story of Dalhousie Medical School. Halifax: Nimbus (2017) (DAL Health Sciences Library W18 M979N 2017). Murray, T.J. & Murray, J.. (1999). Sir Charles Tupper : fighting doctor to Father of Confederation. Markham, Ont. Associated Medical Services : Fitzhenry & Whiteside. Murray, T.J. & Murray, S. (1983). History of Dalhousie Medical School. VoxMeDal: voice of Dalhousie medical alumni 1982-83. Part I. 12-14. Murray, T.J. & Murray, S. (1985-86). History of Dalhousie Medical School. VoxMeDal: voice of Dalhousie medical alumni 1985-86. Part IV. 5-11. Stewart, Dr. C.B. (1968, September 14). Founding of Faculty of Medicine "Disputed." Chronicle-Herald and Mail-Star. A Century of Medical Teaching. Special Report. 11. This history of Dalhousie medical training, produced in 2008, is narrated by T. J. (Jock) Murray, Professor Emeritus, Dalhousie University, Faculty of Medicine.